Susan Jones was faced with a life or death situation when her golden retriever Blondie was taken ill hundreds of miles from home.We always assume that when one of our pets is taken ill it will be in the comfort of our homes where we can tend for them until they recover. 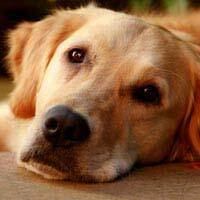 For Susan Jones it became a nightmare when her eight month old retriever collapsed while they were taking a holiday. “I had just started the hobby of dog showing, Blondie loved it and we had booked to enter some shows in Wales. As this was many miles from our home in Essex I booked into a dog friendly hotel for a fortnight and we made a holiday around the shows. We had enjoyed the day at a big championship show where there were many hundreds of dogs. The sun shone and we had been successful in winning the award of best puppy in our breed. This meant we had to stay to compete again against other puppies later in the day. As for once we did not have to face a long drive home I was able to walk around the showground and watch many other breeds. A friend had pointed out that a few more dogs than usual had collapsed in the hot sun and we were careful to make sure that our dogs did not stay out in the sun too long. Even so news soon spread that some dogs were being sick which was worrying as dog show people are so careful with the health of their dogs. After competing unsuccessfully in the best puppy class we left for our holiday hotel some twenty miles away. Blondie was quiet but then it had been a long day and I did feel quite exhausted myself. After a cool drink of water she went straight to her bed which I’d placed in the en suite bathroom where the tiled floor was cooler for a dog and lay down not wanting her dinner or the usual cuddles and fusses. Within the hour she was really sick and before I could get her outside hot smelly liquid was shooting from her rear end. Without wanting to upset her too much I Cleared up the mess and opened the windows to freshen the room. Although I was worried about Blondie I was also aware we were in a hotel room and needed to keep it clean. The next hour saw Blondie have even more accidents and she started to burn up. I telephoned down to the reception and ask for help. I was alone with a very sick dog and to be honest I was very scared. The lady in the reception office had met Blondie and had made a fuss of her when we booked in. Rather than scold me for having a sick dog in the room (which I was worried about) she at once left her desk and came to my aid. She telephoned a veterinary surgery that was quote near to the hotel and they told us to take Blondie straight to the surgery even though it was after hours. By then Blondie was almost lifeless, I thought she would die. Natalie, the receptionist insisted on accompanying me, in fact she drove my car so that I could hold Blondie and comfort her during the journey. All of the hotel staff were marvellous and so supportive. The vet was so lovely even when I burst into tears as Blondie was put onto a drip, not making a murmur as the needle was put into her leg. I rang my friend who had been at the show, she told me she had heard that other dogs had been taken ill as well and gave me the telephone number of the vet on duty at the show. Blondie’s vet liaised with him and it seemed it was a very nasty virus that had spread like wildfire through the show ground; sadly one dog had already died. Blondie was kept in the surgery for five days while she fought the illness; I was allowed to sit with her as much as I wanted to. When she was over the worse we returned to the hotel where she was treated like a princess by staff and guests. What would I have done if the hotel had not been so helpful I don’t know, and I dread to think what would have happened if Blondie didn’t have pet insurance. One day we will return to the hotel for a proper holiday and hopefully no doggy tummy bugs!"